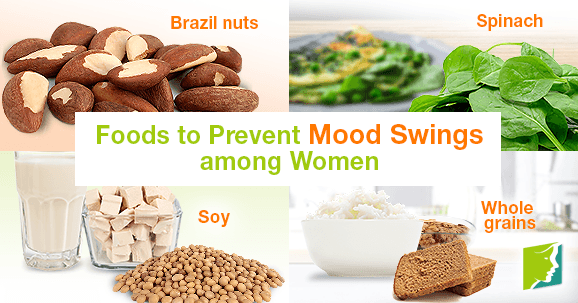 Vitamin deficiency, as caused by unhealthy eating habits, can trigger mood swings among many women. Though you may just want to eat a box of pizza, carton of ice cream, or entire bag of chips when your moods have you down, it will surely make you more irritable. There are a variety of foods that are especially excellent for fighting off impending emotional outbreaks. Learn what vitamins and minerals are most called for at this time and the best ways to get enough. If you have experienced a mood swing, then you know anxiety well. Your nerves will have you worried, paranoid, restless, and unable to focus on simple tasks. Selenium is a mineral that is great for reducing stress, and many people do not get enough. Brazil nuts contain 777% of your recommended daily value of selenium. They are by far the best source of this mineral, and are delicious to boot! Enjoy Brazil nuts on their own or chopped into a salad or pasta dish for increased sensations of relaxation. When you are hiding under your covers in a fit of sobs, spinach may not come to mind as a potential hero. However, studies have verified that people who have low levels of folic acid, also known as vitamin B9, are significantly more prone to depression. Dark leafy greens are the best source of folic acid, with spinach at the top of the list. Enjoy this vegetable for an uplifting feeling. You can easily have raw spinach in sandwiches or as part of a big, colorful salad. If you prefer it cooked, add lightly sautéed spinach to pasta or as a side with roasted garlic. Part of the reason that you lack emotional stability during a mood swing is the decreased estrogen levels in your body through menopause. Soy is full of phytoestrogens, which are seamlessly received by the body in the same way, helping to restore hormonal functioning. Soy will allow your hormones and therefore your brain chemistry to work together in a beneficial way. In addition, soy is a wonderful and healthy source of protein. When the proteins are broken down, they create amino acids, one of which is tyrosine. Tyrosine helps produce neurotransmitters such as dopamine and epinephrine, which will make you feel energized and joyous. Whole grains - such as rice, whole wheat bread, and cereal - are all around feel good foods. When you eat these complex carbohydrates each day, they will not only sustain your energy levels for extended periods of time, but they will also generate higher levels of serotonin - a chemical in the brain which is responsible for happiness. If your moods have you down, have a nice hearty bowl of whole grain pasta for dinner, and don't forget to break in some brazil nuts. If you want to balance out your hormones, fight the blues, calm your nerves, and find inner peace, try adding one or more of these foods to your diet each and every day. There are many scrumptious recipes online to explore.